Sir Bobby: Portrait of a truly special man | NUFC Blog. The smile that never faded. I guess there is nothing really left to say, that hasn’t already been said. I’ve had time to reflect and still it’s impossible to accept that he is gone. The last twenty fours is evidence of how many people Sir Bobby reached with his greatness. Traditional rivalry forgotten because he cut across those boundaries because it was impossible to hold him in anything other than the highest regard. As a Newcastle supporter and England supporter he played an influencing role in how I viewed and played the game. He made you want to be a better person. As a fellow Geordie, I am proud to have known he was one of us. But even though he was fiercely proud of his roots, he was not about regional boundaries. And as such he belonged to football families all over the world. We should mourn his sad departure but celebrate all the great things that came with Bobby Robson. A mentor to many but a friend to us all, he was an inspiration. And his legacy within football and within life should be cherished and nurtured. Sorely missed but remembered so fondly, always. God bless you Sir Bobby. 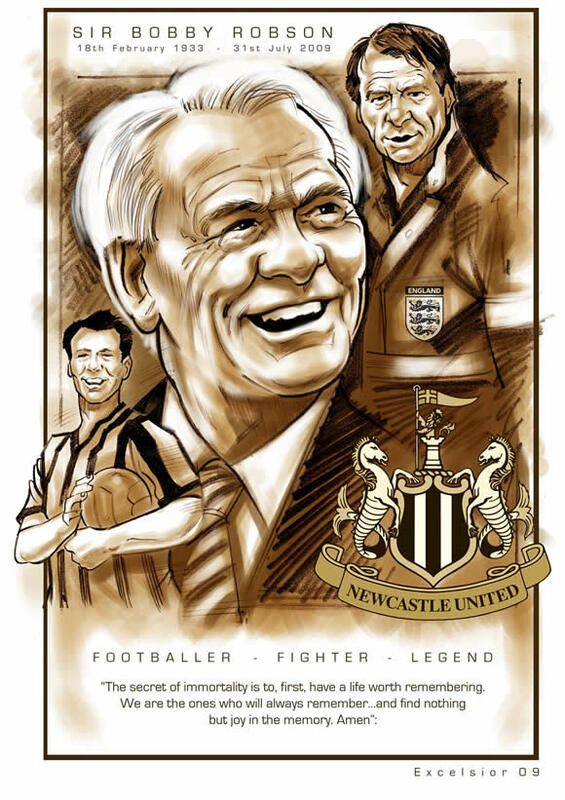 Our thanks for use of the portrait go to Excelsior, an illustrator and Newcastle supporter, saddened as we all are. The final whistle: A biography of Sir Bobby Robson. Part Three – England Manager. The final whistle: A biography of Sir Bobby Robson – Part Two. The final whistle: A biography of Sir Bobby Robson. Part One – Langley Park to West Bromwich Albion and England.